Even in the age of smartphones, an astounding number of pagers are still used throughout the healthcare industry. When compared with other forms of mobile technology, pagers are clearly not the most efficient and cost-effective means of communication. The economics, however, of pager use can be somewhat difficult to evaluate as industry data on pager use is rarely examined as the focus has shifted to emerging technologies. This makes it challenging for healthcare professionals to evaluate the true cost of continued support for pagers against the value they deliver. 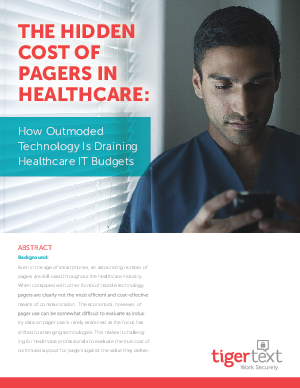 Download this white paper to evaluate the true cost of using pagers in the healthcare industry, and compare it to the cost and preference for alternative technologies, such as secure messaging apps for smartphones.